Preheat oven to 350 degrees. Coat an 8 inch square baking pan with vegetable cooking spray and set aside. In a medium bowl beat combine butter and maple syrup. Add eggs one at a time, beating until light and fluffy. Stir in salt and vanilla - combine the almond and all purpose flour and fold into maple egg mixture. Pour into prepared pan and bake for 20 to 25 minutes or until just golden and top springs back when lightly touched. Cool in pan on wire rack. 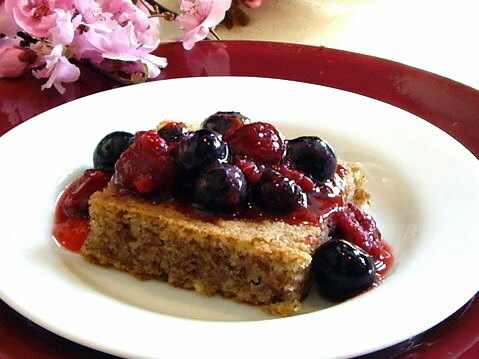 Serve with berry compote.